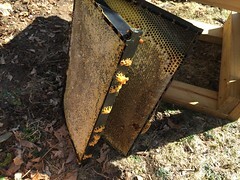 kathy's bees: hive check - "dewinterizing"
At midday today, I opened my second hive, my remaining live hive. The bees were very active, bringing in lots of yellow and orange pollen. I see a few scattered crocuses around in my yard, but I bet they've found another yard with many early spring crocuses and snowdrops. Today is warm. 70F in the shade, but my thermometer is showing 94F on the sunny stone patio. Sunny and beautiful. It's the first really amazing spring day. My bees have been a bit active in previous weeks, but now they are really buzzing around. I opened the hive and checked all levels, pulling out about 50% of frames. My hive is two deeps at this point. There was a nice cluster of bees centered on two frames in the middle of the top box. 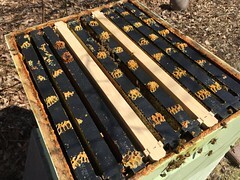 These frames appear to have some open cells, but also cells with and uncapped honey and pollen. I don't see any eggs or brood. I did not see a queen. But then, I'm not good at spotting queens or eggs. Aside from these two frames, the rest of the hive is 80-90% full of capped honey. Even the bottom box has a lot of honey. Maybe half of it down there is uncapped. Both boxes are very heavy, maybe 40-50 lbs for the bottom one and 60 lbs for the top. I was pleased that this hive did not have mold in the bottom box like my dead hive. So, I am assuming that there is a queen in the middle of that cluster of bees and that she will start laying as soon, if this weather holds, and if the workers clear out some space. But I'm afraid there is too much honey in the hive. It seems it got backfilled with honey last fall. 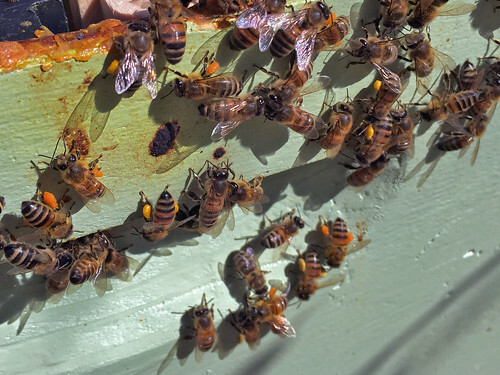 Backfilling refers to filling an empty brood cell with honey or sometimes pollen. In other words, a cell that previously held one or more generations of developing bees, is now used to store food. From what I read, backfilling happens in peak brooding season and checkerboarding (or moving frames around so there are empty frames available for brood) is an approach to counteract it, so the bees don't swarm. Checkerboarding is normally started at the peak of brood nest expansion, just when the nest stops getting larger and begins to shrink. But I didn't do this in the fall. So I'm doing what I can now. I removed two full frames of capped honey (for me!) from the edges of the top box. I kept the two frames that the bees were clustered on together, and pushed the adjacent frames aside. I added in two unworked new frames here. (I wish I had empty worked frames to use instead - I'm going to think about ordering a honey extractor.) So the frame pattern looks kind of like a checkerboard. (A traditional checkerboard would also include alternating frames in the box above the brood area.) I don't think I need to add another box or reverse my boxes. I took the insulating top panel out, added a few thin sticks as spacers, and removed the mouse guard. So, I'll leave the hive alone now for a couple weeks and then check at the end of March. I will hope to find brood then. I think it is still pretty early for bees. March 9. Last year we had a foot of snow still. I don't know when brood rearing usually starts. Greg wrote that he has brood in his hive in western CT. My new package won't come for another month - mid April. I took advantage of the warm weather yesterday to check on the bees and I am happy I did. I left a lot of honey for them last fall and I feed them granular sugar just to be sure they had enough this winter. As it turns out, the entire upper deep (on both hives) remains full of capped honey! They were so heavy it was not easy moving them around. That raised the problem the hive might be honey bound - so much stored honey there may not be sufficient room for the queen to lay to raise enough brood for a good harvest. I added a new deep with ten new frames to each colony. I left the bottom deep as is but those seemed pretty heavy as well, put the new deep on top of it and the deep full of honey on the very top. I kept the honey on top because I have heard wax moths can make a mess very quickly if it is stored in a shed or a garage. I did not look for either queen because I didn't have much time. Fortunately, both colonies have a lot of bees - far more than the original package I started with Aprill 11 last year. With a month to go I expect both will be substantially ahead of where I started last year. One colony has so many bees they started pouring out when I attempted to pick up a frame. I probably should leave them untouched for a month - I learned last year there benefits from benign neglect. However, since bees often build upwards better than out, I may take four frames of honey frams out of the top deep and swap them for the outside frames of the new deep. Last year my bees were reluctant to build out the outer frames - might make sense to put the honey frames there and open the core of the honey deep for more brood. We'll see. I now appreciate why some beekeepers use only mediums or use 8 rather than 10 frame boxes. 10 frame deeps full of honey are heavy and cumbersome to move around. It is waiting for back problems to be sure. I didn't notice it last year because all of my honey supers are mediums. Other than not moving some of those frames around, I am happy where the hives are for early March. Pollen is abundant, nectar should be soon. If he weather remains good I expect the queens will push the workers to build out comb on the new frames very fast so she can lay eggs. My next worry will be swarms! Sounds like our hives are similar, except I have fewer bees I think. But my boxes are very full of honey too. Rather than add another box, I added two new frames on either side of the cluster and removed two full frames of capped honey from the edges. I thought a whole box was too much extra space at this time for my smaller cluster. I'd say I have fewer bees than my original package last spring, but it's a month earlier still. I still amazed how much pollen and likely nectar too that they were coming back to the hive with. I wish I had the time yesterday to sort of dig in to find the cluster but I worked and it was getting late when I got home. I'm reasonably happy with the current situation - now I hope I have the patience to just leave them alone for the rest of the month. It's a pretty active time of year to leave them alone for a month. I'd be too curious.